The freezer is the most important device as far as food storage is concerned. In case you have to replace your old existing freezer, or maybe you have just about bought your home and are looking for a freezer for the very first time, you are probably striving to choose between different options. We know how difficult it can be. Nowadays technological developments have made it possible to find ourselves between different choices, in terms of quality, features, standards and price. We are aware that whenever choosing the right freezer, there are several elements one has to take into consideration in order to make the right decision. That is why we have engaged our best experts to provide this information to you in a concentrated way. Size is a very important element. Once you are about to buy a freezer you have to consider the type of family habits you have in terms of food. If you have a large family that consumes large quantities of frozen foods than the size should be relatively large. The same rule applies if you are the kind of household that buys a lot of vegetables during their session and stores them for when out of session. Whilst, if you are the kind of person that lives alone or has a small family that does not consume large amounts of food, you can choose a smaller freezer that will fit your needs. This is another element to be taken into consideration when buying a freezer. If you are living in a small apartment than most probably you will go for a decently small sized freezer that can suit the room where it will be placed. Instead, if you have plenty of space than size will not be your concern, but appearance might probably be. Honestly speaking, nowadays we are not looking only after functions but appearance and elegance have its own importance. Thus, whenever buying a freezer or refrigerator it is important to consider the room or kitchen style. Here we are with another challenge, and most probably this is the toughest of all. It is quite easy to choose the right size and dimensions, but the things get harder when you have to choose between different options. The first group of freezers is usually offering quite similar features. Both of them can be with interior lights and automatic defrost, baskets and temperature control. But, there are some other elements that do make the difference amongst them. For instance, chest freezers do offer a better energy efficiency than the upright ones, but the latest are more manageable in terms of interior organizing. Considering the above challenges that individuals might face when trying to choose the best freezer that fits their needs, we have asked our experts to make it easier. 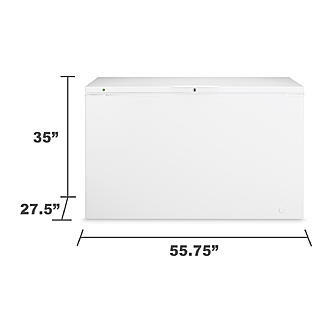 Damby DCF072A2WDB1 chest freezer is a 7.2 cu feet chest freezer. It is coming with a convenient front thermostat that makes it easy to check the temperature. This chest freezer has a sliding storage basket that facilitates storing of different food categories. It easily passes through most of the standard doorways. It has a compact design that allows it to suit any place in the home, considering its feasibility to be transferred from one room to another. It is being offered with a good price that can be considered as an option to anyone who wants to take advantage from what the freezer offers. In case you are looking for a freezer that provides enough storage room and requires a reasonable place in your house, than The Damby DCF072A2WDB1 chest freezer properly fits your needs. The Midea WHS-129C1 Single Door Chest freezer is mechanically controlled and is equipped with an adjustable thermostat. The interior parts can be easily cleaned. The appliance can be easily balanced and fit in any indoor space due to its elegant design. The providers of this freezer have been taking care of the necessary indoor quiet. The whisper-quiet technology enables the freezer to silently pass through on and off cycles. The freezer is being offered by the providers at a very challenging price if we compare to other similar freezers in the market. This option is appropriate for small apartments since it saves time and energy. The IGLOO 3.5 cu ft. Chest Freezer is a top loading one that is properly adjusted to any place at home, outdoors or garage. It has an adjustable thermostat and a defrost frain that enables the end user to easily clean the inner rooms. This freezer is proudly organized in a number of shelves that allow you to store food in separate compartments. The product price is reasonable and quite fair considering the similar products found in the market. This option can find its own place in your kitchen or store room and enable you to freeze considerable amounts of food that can be furtherly defrost. The Haier HF50CM23NW 5.0 cu. Ft. capacity chest freezer can hold up to 175lbs of frozen food. It is built with an adjustable thermostat control and an easy-access defrost drain. Its flat back design allows it to suit any modern to traditional room inside the house. Even though the size of the freezers is not usually nice-looking, this specific freezer allows itself to proudly be placed anywhere in the indoors. The price of this freezer is considered to be a mid-high range one. If compared to other freezers in the market and taking into consideration what its features offer, the price can be considered reasonable. If you are looking for a good looking freezer that can store considerable amounts of food and still cost you reasonably, the Haier HF50CM23NW 5.0 cu. Ft. capacity chest freezer might be your choice. This compact, flush back design coming with the SPT UF-304SS Energy Star Upright Freezer is ideal for families living in small apartments. It is made of 3 pull out baskets for perfect storage. It is equipped with an adjustable thermostat, lock feature and key. The mechanical adjustable thermostat saves you unnecessary energy consumption and efforts. It can be considered a high end device that offers excellent features compared to other devices within the same price range. Our professionals would suggest this freezer to all those individuals who are looking for perfection in terms of functions and appearance. Whynter CUF- 210SS is another freezer our experts have taken into consideration to be included in this best freezers reviews guide. Its door is made of stainless steel material. It has a cylinder lock and a couple of keys. The size and dimensions of this freezer allow it to be even easily carried outside home. Probably if you are camping for long periods of time, this freezer can become your van companion. It is being presented to the potential buyers with a good price that can be considered by any buyer category. This is a good choice whenever you are a person who likes to travel around and experience nature. It is also advisable to small families or couples living in small sized apartments. The Edge Star 1.1. Cu. Ft Convertible refrigerator is another stainless steel freezer coming at your choice from our best experts. It is equipped with a full range thermostatic control. It has a lock for assuring security. The providers have conceptualized the freezer to be energy efficient, thus they built it with manual defrost. The Edge Star 1.1. Cu. Ft Convertible refrigerator / freezer supports temperatures from 0°F to 40°F. All the end users need to do is turn the thermostat and select the appropriate temperature. Here we are with a mid- high range price which has to be considered as another added value to this product. If you are looking for a full option freezer and space is your concern, this is the freezer that properly fits with your requirements. The Midea WHS-52FB1 model is a combination of style and function. This model has a net capacity of 32L/1.1cu.ft. Full mechanical control with adjustable thermostat. It also is energy saving. The reversible door is one of the most interesting parts of this Midea model, considering that it can fit to any situation or position in your home. The reversible door can swing left or right as per your individual needs. This option is found in the market with a superb price considering the features of the appliance. In case you are looking for a nice looking freezer that does also provide all the functions that you can think of, than this Midea model is the appropriate one. The Igloo 6.9 cu ft upright freezer is coming with a manual defrost function and reversible door. The thermostat is fully adjustable and the providers have been taking care for the noise element. The freezer switching cycle is not relevant to the ears. The cycle switch of this freezer is not heard thus, it makes the freezer highly enjoyable for small indoor spaces. Here we are again with another high end freezer. Anyways, we have to mention the fact that the functions of this appliance double surpass the price it is being offered to the end users. If you are looking for a freezer that can save you energy and storing, than this is the appropriate and tailored solution to your needs. If you’re looking for a small freezer for extra indoor or outdoor storage, this stainless steel look upright has the space you need. This freezer is designed for easy setup, cleaning, and movement. It’s light enough to move easily, and the reversible door assures it can open no matter how you position it. Although the front is not actually stainless steel, it does blend in well with stainless steel appliances. An adjustable thermostat controls temperature, but the freezer only features manual defrost. It is extremely easy to operate and seems to genuinely do well both indoors and out. All buyers need to do is plug it in and adjust the thermostat to their desired temperature. The freezer does all the work from there until it’s time to defrost. Since this is a little more expensive than the mini fridges college students keep in dorms, it’s reasonable to expect an auto defrost option. That option may have been traded for improvements in durability, though. The freezer rides the line between a bargain product and a midrange option. If you want a reliable unit for extra storage, this is a good overall investment that won’t shatter the bank. It is very simple, and the basic design gives users a lot of flexibility. The freezer lacks the usual grate-style shelves, featuring a thicker, plastic option instead, which are vastly easier to clean and less prone to drippy messes. As light and easy to start as it is, this freezer isn’t a great choice for anyone who needs a movable option. The manual defrost restriction makes transporting the freezer and its contents terribly inconvenient. If you don’t have a yard or patio where it can drain and air out, the process will be even worse. That said, this is a pretty good choice for someone with a stable living arrangement. In this section, we will discuss what you should look for and what to take into consideration when searching for a new freezer. The same criteria were used by our team of professionals when selecting the 10 freezers to include on our list. This aspect is probably the most important when it comes to making any major purchase. When it comes to any appliance, you should have a budget set in mind, but also compare the long-term costs between different freezers. For instance, an energy efficient model may cost more, however, the costs over time of running it will pay off in the long run. With this in mind, upright models tend to cost more and use more energy than a chest freezer. Other features, such as automatic defrost, will also end up costing you more. However, you may find the convenience to be worth it. Before you start your search for a new freezer, you should first take into consideration the size and capacity of it. First, you need to have an idea of how much your freezer will need to hold, in order for you to decide on the one that is most suitable to your needs. With this in mind, you also need to know how much space your freezer will take up in your kitchen, or whatever space you decide to place your appliance. This means that you will need to measure and make sure you have enough room for the new addition. It is common knowledge that a freezer needs to be running 24/7 in order to keep your food frozen. By choosing an energy efficient freezer, you can make a noticeable difference to your energy bill. Energy Star rates freezers so looking for one of their qualified models can help you determine which one functions well in terms of energy use. Many factors can be taken into account here. This includes things such as how often you go shopping, how many people will be using the freezer, and what your eating habits are. While searching for a freezer, make sure that it has enough space to accommodate all of the foods you normally have. By factoring in eating habits and shopping trips, as well as the times when you can expect your freezer to be at its fullest (holidays), it can all help in determining which sized freezer is ideal for you. The main reason upright freezers are an appealing choice for many consumers is due to their ability to keep foods organized and easily accessible. They generally come with compartment dividers, shelves, and some will even have drawers. Upright freezers are designed so that you are able to retrieve the item you need, whereas other freezers, such as a chest freezer, you will need to dig for the item if it is not on top of everything else. A freezer’s blackout performance indicates how long the freezer will keep the items inside cold during a power outage. However, not many buyers will find this a necessary issue because it may not happen that often, but having a freezer that performs well during this type of situation can be extremely beneficial. These freezers can keep you from needing to throw away spoiled food, as well as repulsive cleaning chore. Chest freezers have the best reputation when it comes to blackout performance, so if you are in an area that experiences frequent power outages, your best choice would be a chest freezer. The FDA recommends that your freezer should be kept at a temperature of 0° F (-18° C). All freezers that are sold on the market are designed to reach this temperature, but you may find that their capability to do so steadily can be altered by the climate at which the freezer is kept in. For instance, if your freezer is placed in your kitchen or any room in the house, then you will not see much of a difference. However, if your freezer is placed inside a garage or anywhere the temperature fluctuates with the weather, then your freezer may not work at its peak performance, although, there are some models that work perfectly in an outdoor setting. Manually defrosting your freezer can be the most time-consuming chore you can encounter. But this is mainly due to the many steps of preparation that comes with it, as well as waiting for the ice to melt, then cleaning and putting your freezer back in its place. This can become quite a messy job. Self-defrosting freezers save you time and effort but do have disadvantages of their own. They generally cost more, are loud, and cause freezer burns to your items more frequently. However, they provide convenience as well as improved energy efficiency. When it comes time to defrost your freezer, there are a few important steps you must take. There are also some ways to make this process go a bit quicker if you are in a hurry. When a lot of ice builds up in your freezer it lowers its efficiency. So when you decide to begin the process of defrosting your freezer, you first need to remove all of the food from your freezer. Not only will you need to take all of the food out, but you will also need to make sure that the food stays cold by either borrowing space in a friend or neighbor’s freezer or you can use a cooler with ice packs. Next, you need to turn your freezer before taking all of the removable parts out, such as shelves, drawers, trays, etc. After this, you will want to make this messy endeavor as clean as possible by piling old towels or dishrags beneath the freezer door to soak up the water that will drain out. If you are not in a hurry for your freezer to completely defrost, then you can simply let it naturally defrost like this. However, if you find yourself in a hurry or just want to move the process along more quickly, there are a few things that you can do to achieve this. With this scenario, you can place bowls or pans filled with hot water into the freezer. The heat from the steaming water will get the ice to melt. However, this method will require you to replace the boiling hot water bowls/pans ever five minutes or so in order to keep the process going. Using a hair dryer to blow hot air over the ice will help defrost your freezer quickly. However, this can be a dangerous method, as you will need to make sure none of the melted ice comes into contact with the hairdryer or the electrical outlet you plugged the dryer into. You can use a fan to circulate warm air into your freezer. But this method will only be efficient if the air in your home is warm enough to make any difference. If your freezer is in the garage, then this method should work and be very efficient. This tactic is more efficient when you need to detach a thin layer of frost rather than large chunks of ice. With this method, you simply douse a rag in boiling water and pour rubbing alcohol on it. Then place it on the ice to loosen it. This method is one of the most popular ways used to help speed up the defrosting process. It is highly recommended that you use a traditional ice scraper, a plastic spatula, or a wooden spoon to avoid the risk of injuring yourself or penetrating the wall of your freezer. Freezing food seems like a simple process that all of us know how to do. However, there are a few things that we do that are not safe and do not allow our food the proper life span. Allow foods to cool before freezing them. Freezing foods while they are still hot will cause the temperature inside your freezer to increase while causing other foods to start defrosting. A full freezer is more economically efficient to run. When your freezer is full of foods and other items, it is more economically efficient to run because the cold air does not need to circulate as much. This means that your freezer takes up less power. Refreezing your food should only be considered if you are cooking it in between. You should only refreeze your food if you are going to be cooking it again soon. The reason for this is because when your food is thawed, bacteria multiply quickly. This is especially true when your food is at room temperature. When you place this food back into your freezer, the bacterium can survive and is more likely to reach harmful levels when you take it out the thaw again. Always wrap or seal foods properly. In order to reduce the risk of freezer burn, you should always make sure that you wrap or seal your foods properly or put them in containers. Freezing does not kill bacteria. If something has been in the freezer for a while and you finally decide you may want it, but find yourself unsure if it is still edible; throw it away. Just because you had it in the freezer does not mean that there are not bacteria living on said food. Label all of your foods before freezing. Whenever you decide to freeze your food make sure you label what it is and the date you froze it. It may seem like a bothersome chore, but when it comes to your health, it is well worth the effort. Also, make sure to specify whether said food is raw or cooked. Along with freezing food properly, there are foods that should not be frozen, things that you should know about freezing everyday items, as well as some items that can be cooked while still frozen. Eggs: raw eggs that are still in its shell will expand and crack; Hard boiled eggs will become rubbery if frozen. Vegetables: particularly ones that have high water content. These include lettuce, cucumber, radishes, etc. Certain Dairy: plain yogurt, low-fat cream cheese, single cream, and cottage cheese are known to become watery if frozen. Butter and margarine can be stored in a freezer for up to three months. Milk can be frozen for up to one month in a freezer. However, it is recommended that you defrost frozen milk in the refrigerator and shake it well before using it. Grated cheese can be stored in a freezer for up to four months. You can also use it straight from the freezer. Raw pastry can be stored in a freezer for up to six months. Most bread can be frozen for up to 3 months. Sliced bread that has been stored in a freezer can also be toasted while still frozen. You can also find some foods are perfect for cooking straight from the freezer. However, it is highly recommended that you start cooking from a low heat setting to thaw, and then increase the heat to cook. With this in mind, there are a few foods that should NEVER be cooked from frozen. This includes raw poultry and large joints of meat. How long will food remain frozen if the power goes off? Food can stay frozen longer if the freezer remains unopened, is completely full, is in a cool place, and is well insulated. Depending on your freezer’s size, a freezer that is completely full of food can typically stay frozen for two to four days. If your freezer is only half-filled then it is said that it will keep food frozen for about 24 hours. To help keep your foods frozen cover the freezer with blankets to help hold the cold. Just make sure that you keep the blanket away from the compressor. Freezer burn is described as dehydration or drying that occurs on the surface of a frozen product if it is improperly wrapped. The food is safe to eat but is of poorer quality. In order to prevent freezer burn, you must make sure that the food is wrapped properly and is airtight. Does freezing improve the quality of food? Unfortunately, freezing does not improve the quality of food. Frozen food is only as good as the quality the food originally was before being frozen. So, select only high-quality products at optimum maturity and freshness. Freezing does not kill all bacteria, yeasts, or molds that can be present in food, but it freezing does prevent them from multiplying if the food is held at 0°F or less. However, when thawed, the surviving organisms can multiply again. Will food spoil if the freezer temperature is above 0°F? Food may not spoil but the quality (color, flavor, and texture) will decrease. The higher the temperature, the faster the quality of your food will diminish. Will food spoil if it is stays frozen longer than the recommended storage time? No. The storage time is a recommendation of which food should be used to guarantee maximum quality. Food that is stored for longer than the recommended storage date can start to diminish by losing its quality (color, flavor, and texture). There are three main types of freezers. However, whichever one is best is solely based upon your own individual needs. An upright freezer is the most popular because of the convenience it offers consumers. Generally, they are easy to move and do not take up too much space. They also usually come with compartments dividers, shelves, and in some cases drawers, which help you keep your food organized. Unfortunately, these models tend to be a little more expensive and usually use more energy. Overall, they provide convenience, are easily accessible, easy to move, and help keep your food organized while taking up a limited amount of space. However, they are less energy efficient and are generally more expensive than other models that are on the market. Chest freezers, also known as deep freezers, are considered a popular choice for consumers that are cost and energy aware. These freezers have the largest capacity out of all three types of freezers. Chest freezers are also known to stay cold longer during a power outage. Unfortunately, they are not as convenient as upright models because getting to items will require digging and maneuvering things around. These models are also known to require manual defrosting. Overall, chest freezers, or deep freezers, are affordable, energy efficient, have a large capacity, and can keep food frozen for longer when a power outage occurs. Unfortunately, it is harder to get to items stored in these freezers and makes organizing difficult. These models also require manual defrosting. The last and third type of freezer is a portable freezer. These freezers are smaller than the other types of freezers, so they cannot hold as much. Fortunately, they usually cost less and can have a variety of features that you will not find with other types of freezers. The portable freezer was designed specifically to allow you to transport frozen food from one place to another without it going bad. It is definitely convenient for taking food on the go and is mostly used for camping, boating, long road trips, etc. It also is not like a cooler because you do not need to constantly keep filling it with ice, nor need to empty out any melted water. Just simply set the temperature and take it on the go. Overall, this model is affordable, allows you to take frozen foods with you anywhere, does not need ice to keep your food cold, and is perfect for camping, fishing, or traveling. However, it does have a limited capacity. With these three types of freezers to choose from, the decision is really up to you for which one is the best. All of these freezers have their own advantages, as well as their own disadvantages. What kind of packaging materials should be used for freezing? The best is to use materials that don’t leak, are vapor and moisture resistant and do not crack at low temperatures. Make sure the materials are able to protect food from absorbing odors or other flavors. If the materials are not hard to seal and can be marked, you have the ideal solution. Can aluminum foil be used as a freezer wrap? Heavy duty aluminum foil can be used as a freezer wrap. However, because aluminum foil can be torn or punctured fairly easy it is recommended to use an overwrap with it. Lightweight (household) aluminum foil is not recommended for freezing. Is it recommended to blanch vegetables before freezing? Yes, because blanching slows or stops the action of enzymes that cause loss of flavor, color, and texture. Blanching cleanses the surface of dirt and organisms, brightens the color, and helps prevent the loss of vitamins. Blanching also wilts or softens vegetables and makes them easier to pack. Heating or scalding vegetables in boiling water or steam for a short period of time is called blanching. Whenever you are about to select the new freezer to be added to your kitchen, you have to make also some further considerations. Our professionals’ advice that, based on a number of interviews, it has resulted that customers happen to get dissatisfied with the equipment once it arrives home. Why does this happen? 1. Customers do not consider the nearest power outlet – In fact, the distance of the nearest power outlet is something to be seriously taken into consideration, since the freezer is a device that requires an outstanding performant power outlet to its proximity. 2. Warranty – When it comes to warranty policy, consumers are advised to be highly cautious. Why? Mostly because freezers are highly used devices that do have a considerable price, thus having a warranty of at least 6 months to 1 year, is a good assurance you will be covered on any inconvenience. 3. Color – When we buy a freezer, we seem to lack the relevance of color. Once the device comes home, we face the fact that it does not fit to our room/ kitchen style. Thus, we have to pay special attention to this element as well. If you are still feeling reluctant or skeptic after having gone through these special considerations made by our professionals, we invite you to through our guide once more and understand which of them is tailored to your needs. It has to be emphasized the fact that, when selecting the best freezers to be reviewed, our experts have been considering different categories of buyers in regards to functions and purpose. Thus, each of the interested individuals can find the appropriate freezer that fulfills his/ her personal or family needs.